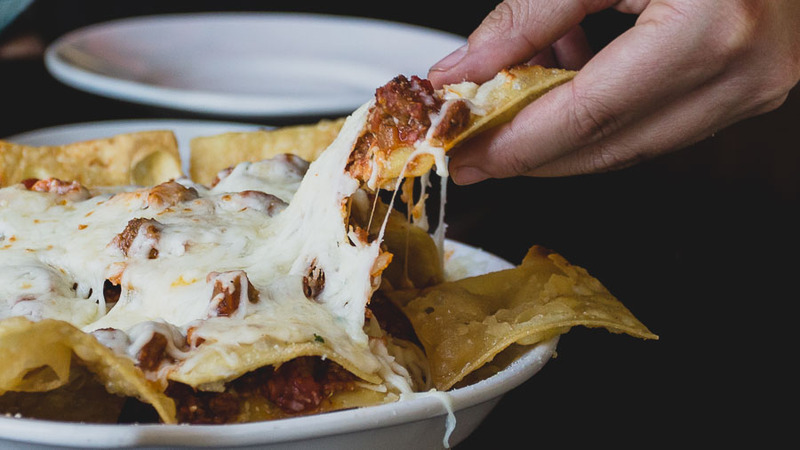 As a way to draw people in to watch the Big Game, Olive Garden has debuted a new Loaded Pasta Chips that is chockfull of hearty toppings. The Garden's made what are basically Italian nachos, with actual pieces of lasagna as a substitute for chips. 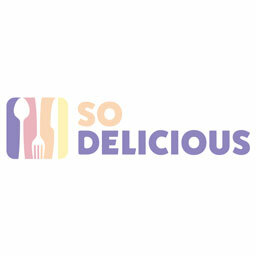 They then get topped with mozzarella and Parmesan cheese, a three-meat Italian tomato sauce loaded with chicken, meatballs, and sausage, spicy cherry peppers, and a drizzle of alfredo sauce. Everything is finished with a garnish of Pecorino Romano, Parmesan, and fresh parsley. 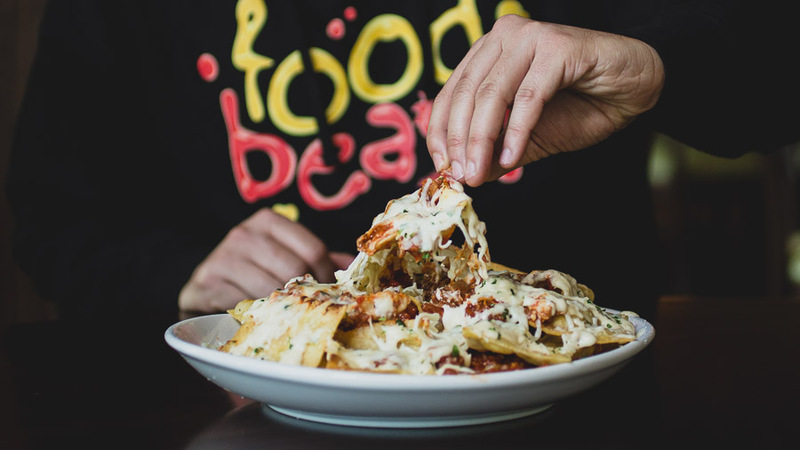 Both myself and Foodbeast editor-in-chief Elie Ayrouth were intrigued, so we headed over to a local Olive Garden to sample these "pasta nachos" for ourselves. 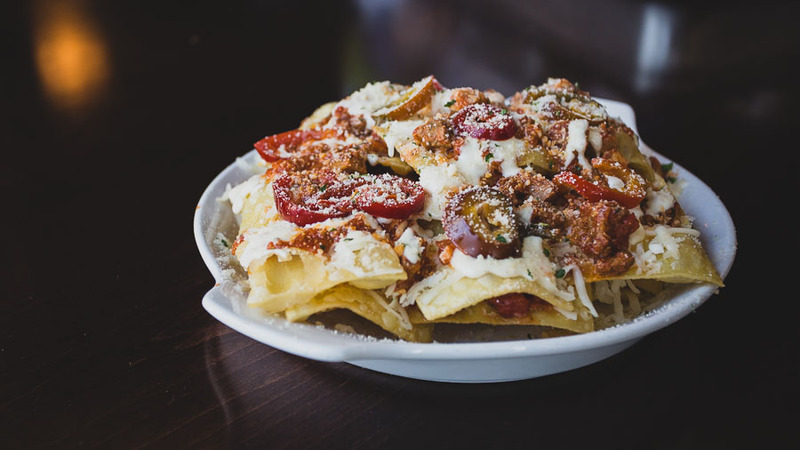 To us, the lasagna chips had a crunch similar to that of wonton chips, but they didn't crumble as much and held up the mound of toppings on it pretty well. The Loaded Pasta Chips are definitely more savory than spicy, but the creamy, nutty Alfredo harmonizing with the hearty meat sauce made you want it that way. They are incredibly rich, so you'll either need the squad with you to finish them all or expect to take some of it to go. Unless you're the type to mash on it all in one sitting, to which we don't judge at all. While this starter may scream Italian based on everything in it, you really won't find a more American food anywhere. I mean, what's more American than turning classic items from one cuisine into loaded nachos? Plus, these are made to eat while watching one of the biggest sports spectacles the United States has to offer. This is America at its most gluttonous, folks, and we're all for it. You can find Olive Garden's Loaded Pasta Chips on the menu through April 1st.